Why most people abandon your shopping cart and never get back to your Shopify store? While there can be tons of reasons for this, one major reason is that your checkout process might be too difficult to handle, too time-consuming, and thus too nerve-wracking. So, whenever you have some kind of a pain, you should find out the exact place or thing that causes the pain and use the right painkillers to get rid of it. You don't want people to bounce away from your online store, right? Then make sure to find out the source of the pain and work hard towards applying the best painkiller. If people are abandoning your Shopify store at the checkout, then there is something about the checkout process that you should rethink, reorganize, redesign, and rebuild. 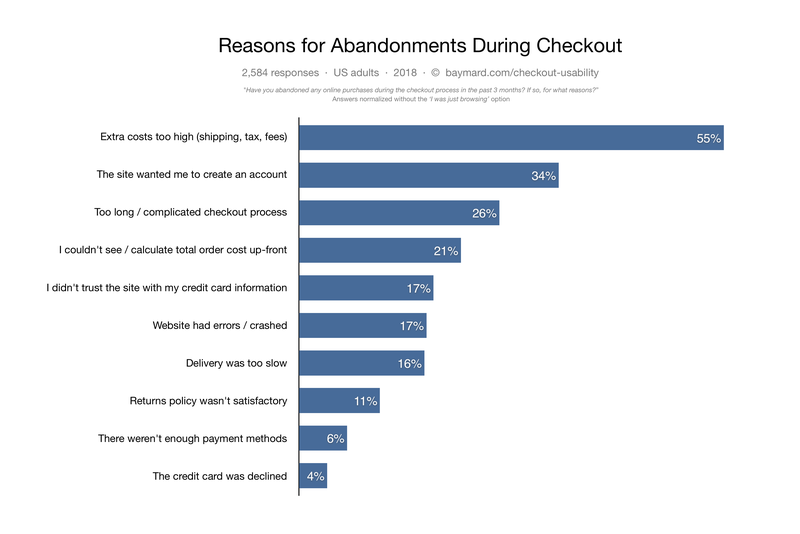 But before jumping into some ideas as for how you could optimize your store checkout process, let's understand the pain aka abandonment rate fully. What is a shopping cart abandonment rate? This term is associated with virtual shopping carts. It's the ratio of the number of abandoned shopping carts to the number of completed transactions. According to Baymard Institute, 69.89% is the average documented online shopping cart abandonment rate. In his book "Conversion Optimization: The Art and Science of Converting Prospects to Customers", Khalid Saleh claims that the best optimized checkout process has an abandonment rate of 20%. Well, that's a number that you should definitely work for! While there can be a myriad of reasons for people to abandon a shopping cart, Baymard Institute mentions the following reasons. It turns out that 1 out of 4 shoppers abandones a cart due to a "too long/complicated checkout process". Is it possible to make a reduction in the number of form elements that the user has to fill out in a checkout flow? Of course, it is. And there are many other ways you can optimize a Shopify store checkout process too. This brings us to the main topic of this article - the steps you should take to optimize the checkout process. Here we go! Let's take a look at Tluxe which is an online apparel store. Once you visit the homepage, you see the free shipping offer within Australia, then as soon as you scroll down the page, you can find information about the Terms & Conditions, Delivery & Returns as well as the Sizing Chart. One more thing you can add here is a phone number so that people can have their last-minute questions answered. Believe me, few people are going to call you but putting a support number on your website can work wonders in establishing trust. People want to know that you will be there for them no matter what. In Brilliant, people have decided to use the trick with the phone number, yet they let customers know that their fastest response is via email. The repetition of trust messages can help boost sales. Look at the example below: Studio Proper has mentioned about the free shipping, data security, and the 12-month warranty right before checkout. Helm is a shoe brand for casual and work boots. At the checkout, they give you the opportunity to opt for either PayPal or Amazon pay. When an online retailer takes multiple cards and payment options, it proves that they have a legitimate payment gateway set up. This gives customers a strong sense of trust. Also, this works great from the point of view of UX since the customer will know right away if they will be able to pay with their preferred payment method or not. So make the card logos visible in the checkout page since it will add more credibility to your brand. Shopify allows adding applications for various purposes. One such application is GTranslate which will help you make your checkout page multilingual. 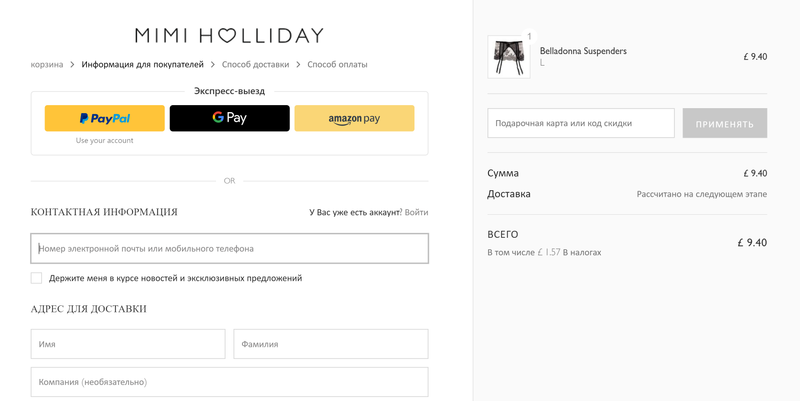 Imagine your overseas customers' reactions when they find out they can read the checkout page information in their native language. This will add a lot of credibility to your online store, improve the checkout experience and can help boost the sales too. The endpoint of the checkout process is as important as the starting point. Once the customer purchases something from you, they will wonder what's next. Make sure to let them know what to expect whether it's providing a tracking code to follow the shipping process or a giving a simple "Thank you!" note. Always spelling out what customers need to do next will help you gain extra trust. 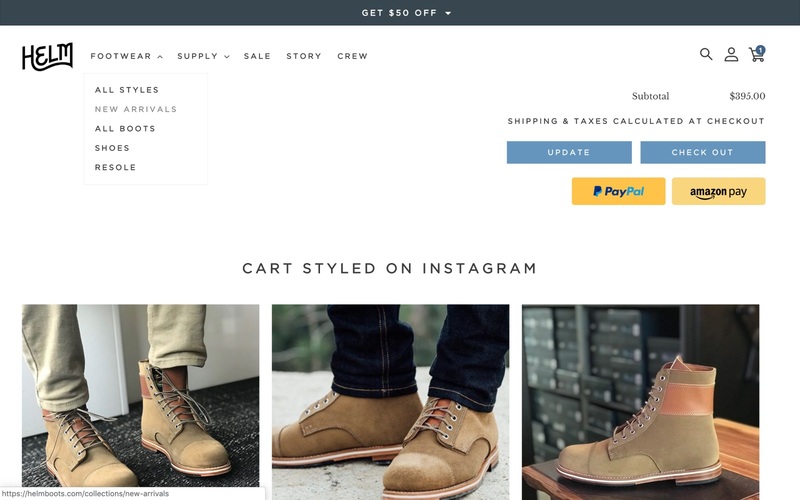 While Shopify might not be fully customizable, it still offers a lot of interesting tools to make your checkout process easier and more efficient. Keep in mind that customers hate long checkout processes and that's one of the reasons they abandon an online store. Arm yourself with the above tactics and start making that checkout page amazing!